The Temple Mount in the old city of Jerusalem is once again in the news. Last July, Ehud Barak, then the prime minister of Israel, amazed the world by offering to cede to Yasir Arafat partial sovereignty over this, the holiest of Jewish sites. A scant two months later, the Palestinians responded to Israel's latest round of concessions by renewing their campaign of violence; interestingly, they portrayed their action, at least initially, as being motivated by a determination to protect a mosque atop that same Mount. When, this past February, Ariel Sharon was elected Israel's prime minister, he for his part asserted in one of his very first policy statements that Jerusalem would remain "the united and undivided capital of the state of Israel, with the Temple Mount in its center, for all eternity." It is thus reasonable enough that Gershom Gorenberg, an American who has lived in Jerusalem since 1977 and is now a senior editor at the Jerusalem Report, should call this site "the most contested piece of real estate on earth." For not only is this man-made hill the place where two ancient Jewish Temples were built and where two principal Islamic sacred sites - the Dome of the Rock and al-Aqsa mosque - now stand, it is also, as Gorenberg writes in The End of Days, the locus of "millennial dreams" for many Christians. 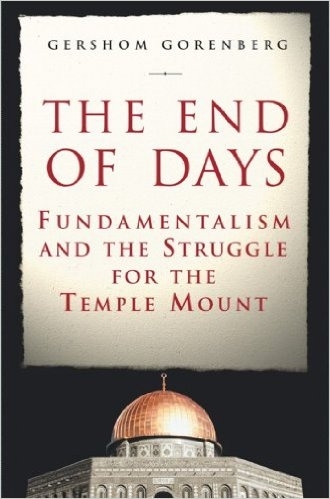 In this well-written book, published just before the outbreak of violence last September, Gorenberg focuses on the role played by the Temple Mount in the expectations of "millions of quite rational men and women, belonging to established religious movements around the globe, [who] look forward to history's conclusion, to be followed by the establishment of a perfected era." Although all three major monotheisms get their due in The End of Days, Gorenberg's main focus is on Christians and Jews. Muslims are cast, somewhat imprecisely, as spectators. As Gorenberg tells it, a large number of evangelical Christians believe that the Second Coming of Jesus will occur after a long sequence of events both miraculous and terrible. In the "rapture of the church," a phrase popularized by the 19th-century British preacher John Darby, true Christians will fly up to heaven while the rest of the world faces seven years of tribulation preceeding the establishment of God's kingdom on earth. Among the many events taking place in those years of tribulation, the Antichrist will desecrate the Temple in Jerusalem - an act suggesting by implication that the Temple itself will have to be rebuilt before the Last Days and the Second Coming can occur. About one-quarter of American Christians, known technically as premillennial dispensationalists, adhere to at least aspects of this vision. Thanks to missionary efforts, the numbers of such Christians are growing in both Latin America and East Asia (though not in Western Europe). The spread of their ideas about the end of the world can also be seen in the sales of books. The Left Behind series, a sequence of thrillers by Jerry Jenkins and Tim LaHaye that follow premillennial dispensationalist lines, has sold ten million copies (and a major film based on it has now been released). Still more spectacularly, Hal Lindsey's The Late Great Planet Earth (1970), another treatment of the "endtimes" and the return of Jesus, has sold some 34 million copies in 54 languages and may be the biggest-selling book of the late 20th century. In America, at least, views of this general nature are hardly recent additions to the Christian landscape. Millennialism, Gorenberg writes, "came over with the Mayflower, and was to be a mark of American religion from then on." One curious result was the spawning of a 19th-century Christian Zionist tendency that predated political Zionism among Jews, and was in place to welcome and buttress the latter's emergence. Thus, in an 1891 petition known as the Blackstone Memorial, named after a Chicago evangelist, 413 prominent American Jews and Christians called upon the President to hold "an international conference to consider the condition of the Israelites and their claims to Palestine as their ancient home." To some Christians, the Balfour Declaration of 1917, expressing the sympathy of the British government with Zionist aspirations, seemed an ancient prophecy come true; how much more so, the establishment of an independent Israel in 1948. In 1967, Israel's recapture of the Temple Mount in the Six-Day war offered absolute proof to some of the prophecy's validity, prompting a turn toward Christian revivalism and increased hopes for a rebuilding of the Temple. In short, millions of Christians around the world sincerely and devoutly believe that the status of the buildings on a plaza in Jerusalem will determine the fate of the human experience, if not of the cosmos. And this means, as Gorenberg writes, that, "through no choice of its own," the state of Israel has been cast "in a starring role in a Christian Endtime drama." According to the terms of that drama, it is imperative not just that Israel control the Temple Mount; the urgent task of rebuilding the Temple is a task uniquely designated for Jews, not Christians, to carry out. However eager evangelicals may be to see a Third Temple rise, the most they can do is to nudge Jews in the preferred direction. Broadly speaking, this means supporting Israel in its conflict with the Arabs, and favoring the party in Israel (Likud) that takes the harder line. It also means, of course, agitating for continued Jewish control of the Temple Mount. Some Christians get involved in more direct ways, by giving generous support, moral and financial alike, to those few Jews who are themselves intent on rebuilding the Temple. In a piquant chapter titled "Cattlemen of the Apocalypse," Gorenberg tells the story of some Christians who have tried to help breed a purely red heifer, an animal whose burnt ashes, according to the Bible, are needed to cleanse the Temple priests of ritual impurity. As for the Jews who also harbor hopes for a Third Temple, they are gathered in tiny groups with names like the Temple Mount Faithful and the Movement for the Establishment of the Temple, their numbers swollen somewhat by those who quarter-believe or half-believe in their goals. Those goals encompass an end to all warfare and an era beyond history. One leader, quoted by Gorenberg, believes that an effort to build the Temple "will bring peace, will bring security, will cure all the ills of society!" (Others may conclude it would precipitate Muslim retaliation and terrible bloodshed.) Some are working toward this end by preparing the precise clothing, coinage, and sacrificial implements needed for use in a rebuilt Temple. And Muslims? With great wariness and a certain bellicosity, they are watching any potential movement between Jews and Christians to pull down the Islamic buildings on the Mount that are collectively known as Al-Haram ash-Sharif (the Noble Sanctuary). What this can mean was seen in September 1996, when the Palestinian leadership provoked a large riot after the Israeli government opened a tunnel exit in Jerusalem a full 200 yards away from al-Aqsa mosque; the subsequent violence resulted in nearly 80 deaths. Similarly, it might not be amiss to see the current Palestinian uprising against Israel as a form of preemptive protection of the mosque at a highly delicate time: the millennial intifada. More surprisingly, Muslims have also become swept up in Temple Mount fever. In fact, so affected have they become by ideas deriving from the West that many now adapt aspects of Christian evangelical eschatology to Islamic ends. Thus, apocalypse-minded Muslims see the creation of Israel as the beginning of a process that is moving toward either the triumph of Islam, the destruction of Israel, or the end of the world. Symbolically, the Christian year 2000 took on for these Muslims a significance that mainstream Islam would never allow, with several popular if heterodox publications announcing that the Antichrist (dajjal in Arabic) would arrive in that year. The fact that some Muslims have come to believe that the world's end is being determined by events taking place at the Temple Mount further inflames an already tense situation - although in practical terms, since the main interest of Muslims lies in maintaining the status quo there, they are not likely to be the ones intentionally taking triggering actions. "It is all too possible that someone, today anonymous, will try to ignite [a catastrophe] at the Mount," writes Gorenberg. And indeed it would take very little to set off a conflagration in this piece of territory, whose ancient walls and buildings could easily be blown up or otherwise destroyed by even a small band of zealots. Gorenberg fears that such events could happen soon. In religious thought, "millennium" properly refers not to a year with three zeroes but to a long era marking the end of normal history and the beginning of God's kingdom. If anything, millennial fevers may be higher this year than during the year 2000 because so many who were expecting the End last year have been disappointed. The historical record shows how such disappointments can lead to violence, and offers a warning to anyone who breathed a sigh of relief when the calendar changed to 2001. "The day after the last is most dangerous," Gorenberg observes. There is also a lesson here for those who might be tempted to dismiss as "Bible babble" a set of beliefs that are in themselves neither nonsensical nor fraudulent. In this country, ignoring the apocalyptic views of David Koresh contributed significantly to the disastrous outcome at the Branch Davidian compound in Waco, Texas. Similarly, writes Gorenberg, by ignoring the "theological crisis set off by the Oslo Accord" among some Jews, Israeli authorities left themselves unprepared for an event like the massacre at Hebron carried out in 1994 by Baruch Goldstein. To forestall violence, he cautions, the authorities must tread a fine line: "not treat beliefs as criminal [but] understand where those beliefs could lead." There is also a more general need - to understand one's friends. In accepting support from "Bible-believing" Christian allies, Israelis have pointedly overlooked a few stipulations of the millennial agenda, one of which has to do with the prospective wholesale conversion to Christianity of the "terminal" generation of Jews. On the other side, some evangelicals seem not to have taken in the fact that, a few marginal figures aside, Israelis have no intention of tearing down the Islamic holy places to build a temple. Surely it is a worrisome sign when each side of a working relationship shelters its own expectations from the other; or when, as Gorenberg writes, each side "often regards the other as an unknowing instrument for reaching a higher goal." His concern is that, disappointed by a Jewish failure to begin the required work of rebuilding, Christian enthusiasts may see Jews as obstructing the rapture and again failing Jesus. "When the 'terminal' generation [of Jews] refuses to reach its terminus, an old frustration with Jews who won't play their role is all too likely to surface." There is at least one precedent for such a change in mood, not mentioned by Gorenberg but lately studied by Michael Barkun of Syracuse University. British-Israelism, a Christian movement that was pro-Zionist before the state of Israel came into existence, turned anti-Zionist when it found itself not invited to help in building the new country. "Like contemporary fundamentalists," Barkun writes, "they needed a Jewish state in Palestine for theological reasons, but that didn't necessarily mean they liked Jews." The British-Israel movement in turn spawned the Christian Identity movement, also known as the Aryan Nation, perhaps the most virulently racist and anti-Semitic Christian movement in existence today. Gorenberg is right to worry about issues connected to the Temple Mount, for they have a unique capacity to precipitate shuddering international crises. At the same time, however, his account underscores the need carefully to differentiate between moderates and extremists, especially when dealing with a phenomenon as variegated as American evangelical Christianity. Beliefs are one thing, acting on them something else. Like Jews who pray three times every day for the rebuilding of the Temple and the restoration of animal sacrifice, the great majority of evangelicals have no trouble distinguishing between the realms of ultimate belief and of worldly action. Thus far, with the exception of a handful of extremists, the center has held, and there is a good chance to expect it will continue to do so.